Online video is exploding, with annual user growth of more than 45 percent. Mobile-device time spent increased 28 percent last year — with average smartphone time spent doubling. And social networks are now used by 90 percent of U.S. Internet users — for an average of more than four hours a month. None of this is a newsflash. Every venture capitalist, Web publisher, and digital marketer is hyper-aware of these three trends. But what’s happening to the rest of the Web? The Web Is Shrinking. Really. When you take these three growth areas out of the picture, the size of the hole left behind is staggering: the rest of the Web — the tried and true core that we thought would have limitless growth — is already shrinking. And it’s becoming less relevant. In the last year, Facebook’s share of users’ time online grew from one out of every 13 minutes of use nationwide, to one out of every eight. In aggregate, that means the document Web was down more than half a billion hours of use (that’s more than 800 lifetimes) this March versus last March. And in financial terms, that represents a lost opportunity of $2.2 billion in advertising inventory that didn’t exist this year. The change in the Web’s direction is a clear indication to me that we aren’t just in the midst of a boom for new interaction modes, but rather in a generational overhaul of the Internet. What replaces the declining searchable Web is a new and “fully connected” digital life. You may have heard this before. After all, the promise of the Web was to connect pages with hyperlinks. Well, this time, “connected” means much more. It means the Web connects us, as people, to each one of the individuals online; and those connections, ultimately, extend from one of us to all of us. Just as significantly, this all happens in real time, and at nearly all times. And here’s what’s different when you connect people, as opposed to pages: Now, the Web knows who we are (identity), is with us at all times wherever we go (mobile), threads our relationships with others (social), and delivers meaningful experiences beyond just text and graphics (video). The connected, social Web is alive, moving, proactive, and personal, while the document Web is just an artifact — suited as a universal reference, but hardly a personal experience. Analytical explanations — increasing smartphone penetration, bandwidth availability, and technology sophistication — fill in some of the gaps as we try to understand this sea change, but they fall short. Something larger is afoot, and it’s not about science or technology. Rather, as human beings, we have changed how we fit the Internet into our lives. And the nature of the Web is changing to match. The old searchable Web is crashing; while the new connected, social Web is lifting off. The implications for publishers are massive. The last decade has been defined by the rise of Google as the nearly limitless supplier of traffic to digital media properties. And so a generation of digital media publishers developed and followed the same playbook: create lots of content around top keywords, engineer for search engine optimization (SEO) and expand the surface area in search engines to reach more users. The objective was to catch visitors in their net; expand reach — as measured by ComScore — look more impressive to advertisers and capture more demand. The landscape is changing, and fast. SEO’s strategic value is quickly fading as Google’s growth slows and its prominence in distribution slides away. In its place, Facebook has become the wiring hub of the connected Web — a new “home base” alternative to Google’s dominance of the last decade. Facebook began receiving as many visits as Google in March 2010, and already garners more than three times as many minutes as Google each month from users, according to comScore. Looking ahead, the best projections of U.S. online reach indicate that Facebook will surpass Google on that metric in less than a year, too. And with this change, the nature of the relationship between users and publishers is being altered fundamentally — and perhaps forever. Search offers a utility relationship, connecting users to content for the briefest of transactions; typically, it provokes users to just one pageview so they can find a piece of information, and then they move on. But social discovery builds a relationship. Leveraging social endorsements and an environment of serendipitous discovery, consumers meet publishers in a meaningful context. As a result, the relationship that forms is stronger — and, more importantly for publishers, it’s branded. Unlike the ecosystem set up by Google, where the search engine ironically intermediates between users and the objects of their queries (so that users reinforce their loyalty to Google, far more than to the publisher), in the world of social publishing, the Facebook hub enables a direct, if constrained, relationship between users and media brands. The results — at least for my own company, Wetpaint — are that social media brings more qualified eyeballs and retains them. People who come via social media stay longer on the first visit; and they are more likely to come back sooner and more frequently. Overall, our visitors from social networks have a relationship that’s several times stronger — and several times as valuable when measured in engagement, pageviews, and revenues — than the relationships people form when then arrive through search. But it’s not just a change in mechanics. It’s a change in our human relationships. Lewis D’Vorkin, the Chief Product Officer at Forbes, speaks of it when he and Alex Knapp talk about “live” media, quantum entanglement and mutually rewarding relationships that bind authors and readers on the new connected Web. It’s a sense of the Web moving from static published reference to living digital companion. But there’s even more, and this vast change foreshadows bigger and better impacts on our lives. The greatest innovators in social media are driving exactly along that edge today. As one friend commented recently on the full potential of connected lives, by being joined more closely together, we can increase empathy and meaning, while decreasing isolation. Admittedly, we’re early in the replacement cycle when it comes to the connected Web. 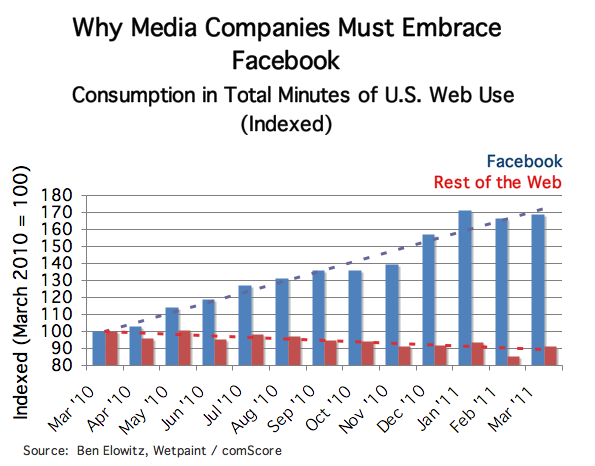 Even for strong connected Web performers like Huffington Post, Wetpaint, and others, the sum total of traffic from Facebook, Twitter, video, and mobile may add up to only half the total, or less. But the trend has tipped, and with that tip has come both the business necessity and the human impact potential of elevating the relationship. As the document Web of old shrinks, the new connected Web expands and delivers experiences that make our time online more effective, efficient, and enjoyable. And that changes the role of companies on the Web from mere content publishers or providers to truly connected digital partners for real people. 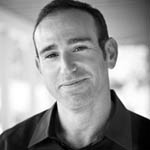 Ben Elowitz (@elowitz) is co-founder and CEO of web publisher Wetpaint, and author of the Digital Quarters blog about the future of digital media. Prior to Wetpaint, Elowitz co-founded Blue Nile (NILE). He is an angel investor in media and e-commerce companies.